As mom’s summer adventure with me draws to an end, we begin the fun task of getting her back to Michigan. While it is only a 13 hour drive, I have learned it is better for her to stop half way to rest then it is to try to make it the whole way if we leave later in the day. She had an appointment at 9:30 am on the day we were heading out, so I knew we would not get out until the late morning / early afternoon. 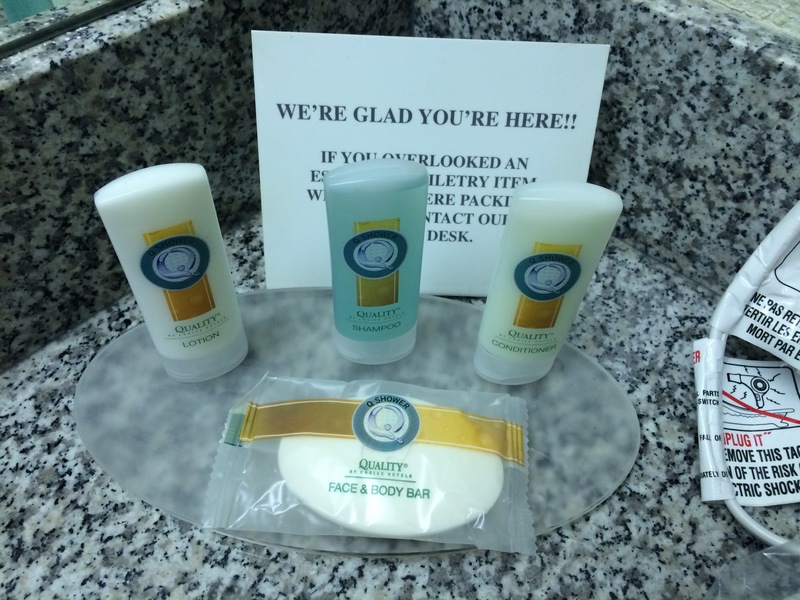 We ended up staying the night in the Quality Inn & Suites in Bloomington, Illinois. Bloomington, Illinois is about half way so it is a good place to stop. As I have mentioned before, LaQuinta tends to be my first “GoTo” hotel. The LQ in Bloomington has disappointed me personally once before and then, on the trip down, we were reminded how horrible they are from an ADA (American’s with Disabilities) standpoint if you choose to stay in a non ADA room. My biggest complaint with most hotel chains is they do not have ADA rooms with two beds. So any parent traveling with a child who may need this have to “throw a cot” in there or, as in my case, two adults traveling together have to pay for two rooms or if we want to save money and share a room, mom doesn’t get the benefits of the ADA facilities. It’s fine for one night, but if it was more than one, we would probably have to go with a more expensive hotel chain or get two rooms. 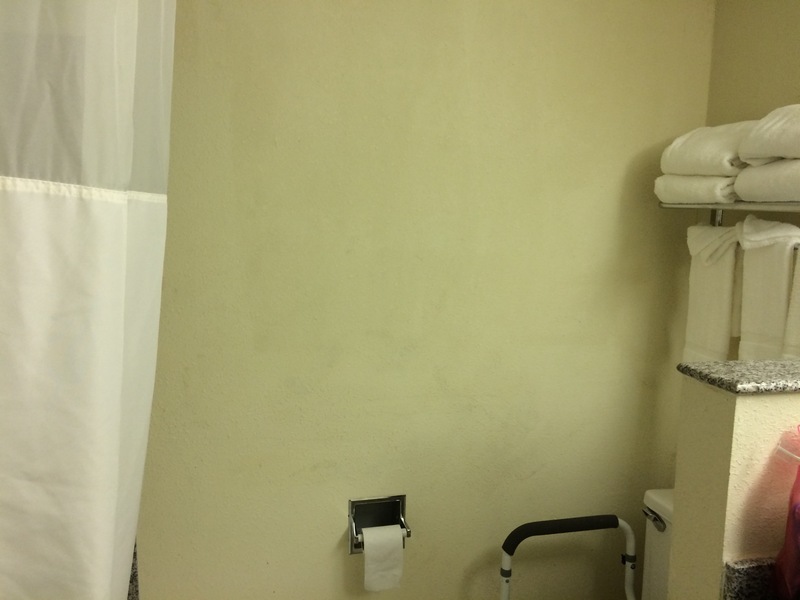 I have written LaQuinta about this and was assured they were working to correct it and every location would have at least one ADA room with a roll in shower and two beds by the end of the year (two years ago) so clearly that has not happened. 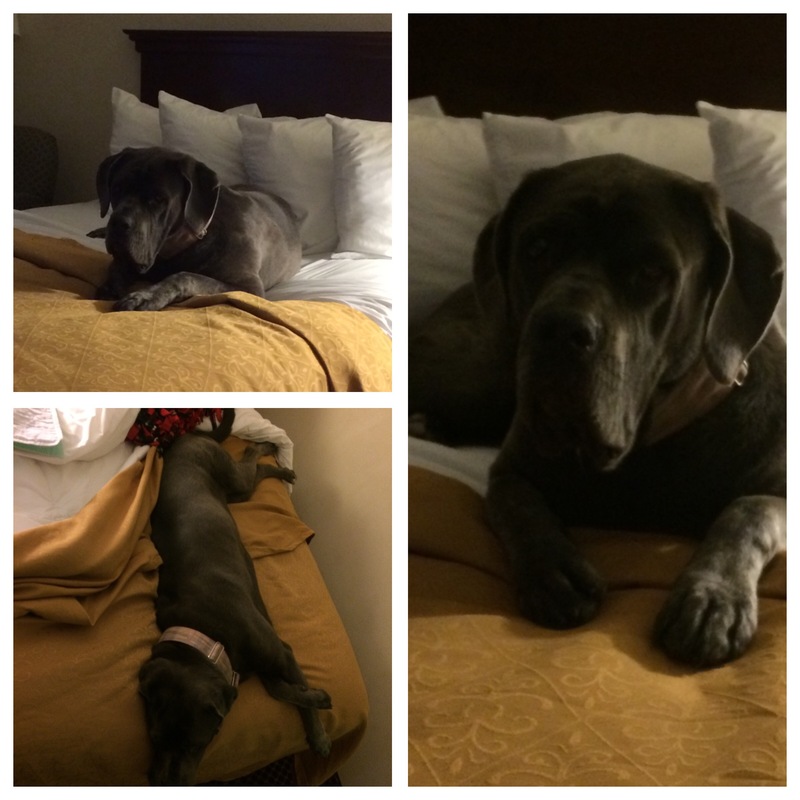 Back to my dilemma for THIS trip….I needed a dog friendly hotel my mom could use. The LaQuinta in Bloomington was out because their non-ADA rooms have a weird bathroom layout where the toilet is in a corner. You can’t get the walker in there and the toilets themselves are extremely low. She had difficulty getting up and without the walker to help or handles, it is horrible for her! I don’t understand WHY hotels continue to use the low toilets. 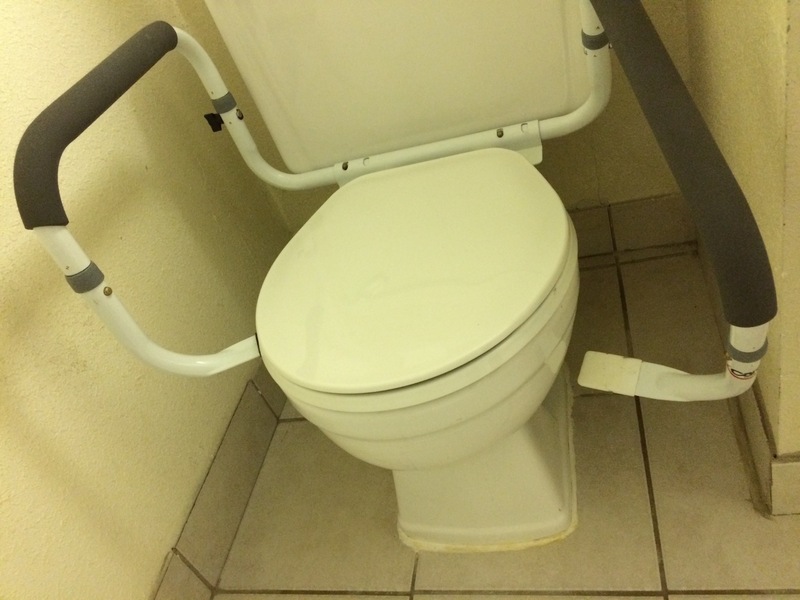 If they would just put ADA height toilets in every room, it would be easier. I went through and switched all of mine to ADA height, even the ones my mom won’t use. I love them! But again, back to the review on THIS hotel……We ended up here because they advertised their dog friendly rooms and when I called, they had an ADA room with two queen size beds. Worked for us. I broke the review down into sections to make it easier for the ADA traveler, the Pet Traveler, the every day traveler, etc. Our room was pretty spacious and I don’t think it was just because of the ADA portion. It seems like they would all be similar. Sometimes in hotels in this price point and older styles, the rooms are a little cramped. Not the case. The rooms were clean, well laid out with the two beds, a desk, refrigerator, dresser, and a chair. While the room was clean, I can’t say they are well maintained everywhere. The dresser had two broken handles. It had an older feel to it, except the shower! 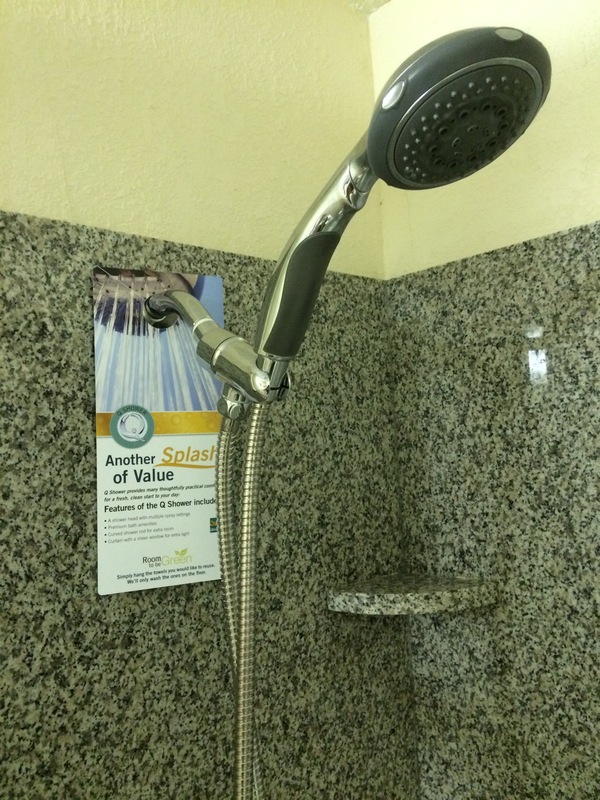 The shower looked like it had been renovated and were featuring Quality Inn’s “Q Shower” which includes a nicer shower head with multiple spray settings, premium bath amenities, curved shower rod for extra room, and a shower curtain with a sheer window for extra light. The shower itself had a nice granite look to it. You could tell it had recently been changed. I will address the ADA standpoints in a separate section towards the bottom of the post. The breakfast was pretty impressive for a hotel in this price point. Waffles: Original and Blueberry. I would have preferred the spray to keep them from sticking, but not bad. Syrup was on every table. I appreciate little touches like that. They converted a room into a fitness room. It has three pieces of equipment. Enough for you to get a decent workout in but nothing extensive. To be fair, I looked at it to comment, but I did not use it. It is an outdoor pool. I didn’t swim this trip, but saw others swimming. It looked clean, decent size. A nice touch is it has a chair lift so anyone needing assistance into the pool would be able to utilize it with minimal effort. Again, a surprise to see for the price point. Good ADA points there! The staff I encountered appeared pleasant, the associate working in the breakfast area was very nice. Asked if we needed anything more than once. A touch you don’t expect, but appreciate. The night manager, Kevin, was great about helping me get the online rate even though I had to book the ADA room over the phone because the ADA room was not an option on the Choice Hotel app. When I checked in, he hand crossed out the rate and wrote in the correct rate, the one he agreed to over the phone. He wasn’t going to give me a copy of it at first but I insisted. Without it, it would have been my word against his about the rate. I am glad I did because sure enough, when I went to check out, they had charged me the higher rate! I brought it to their attention and the two young men working the desk at the checkout had a heck of a time fixing it because they had already checked me out of the hotel. They were extremely nice and worked diligently to get it fixed without making me feel like I was being a pain. It was about a $20 difference. They finally figured out how to get it corrected and were friendly and apologetic throughout the whole ordeal. I had no problem waiting because their attitudes were GREAT! Even the staff I passed in the halls with the dogs were smiling and friendly. They advertised themselves as being pet friendly. Referenced their “pet friendly rooms” and they had a sticker on the door telling you to rate them on Bring Fido. I think this set the bar high for me as to their pet friendly qualities. 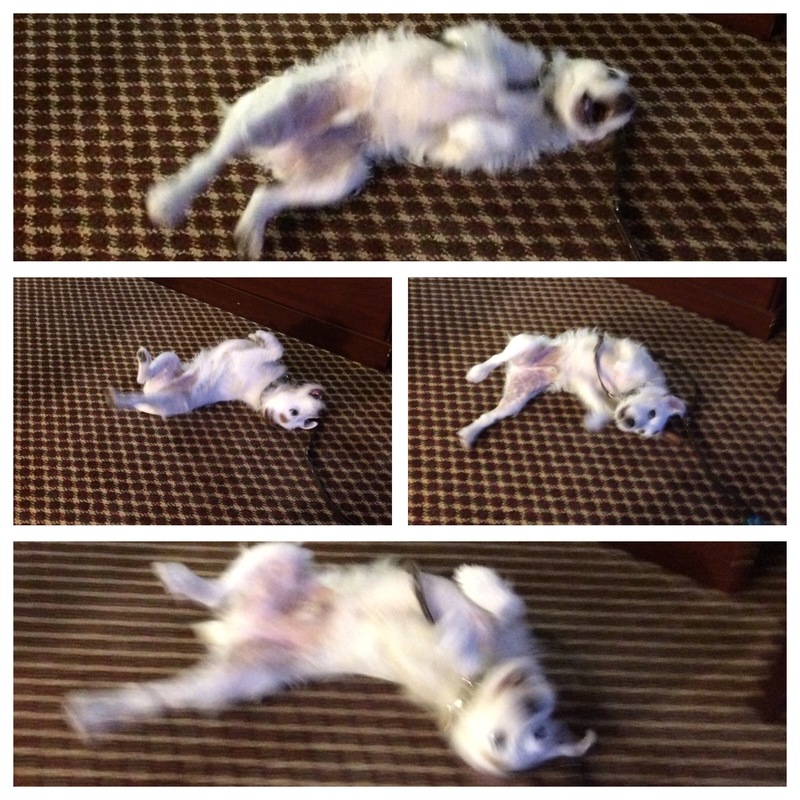 As I mentioned, the room was pretty spacious, so it allowed the dogs ample room to play. I was happy about that. They needed to release some energy. When I took them out is when I had areas of concern. The first is, NO TRASH CANS at the doors! As a responsible pet owner, I pick up my dogs poop. Everyone should if they travel with their dog(s)! Other owners don’t want to walk in it. I walked almost all the way around and saw one trash can at an entrance besides the main entrance. There really needs to be more. The next problem is the limited space to actually walk the dog(s). There is very little grass around the hotel and where it was, it was extremely drenched, tore up with some tire marks, making it muddy. My dog Zipper will poop or pee anywhere so he went on the rocks around a tree near the entrance by our door, but Bella is a little more selective and has to have just the right spot. She didn’t even go to the bathroom the morning we were leaving. She waited until we arrived at a rest stop and then went. I know they can’t do a lot about the grass because of their layout, but they really need to add more trash cans! The “bar” just slips out very easily. It just tucks up under the seat with nothing holding it there. As I mentioned with the swimming pool, they do have an ADA chair lift to swim with though. I just wish they would take a look at their rooms and update them just a little more when it comes to being ADA standards. If you are looking for a reasonably priced room in Bloomington with a great breakfast and a welcoming staff, I would recommend this location. Traveling with pets? Again, a nice place to stay, just be prepared to throw your pet’s poop away in your room or take a hike around the hotel! 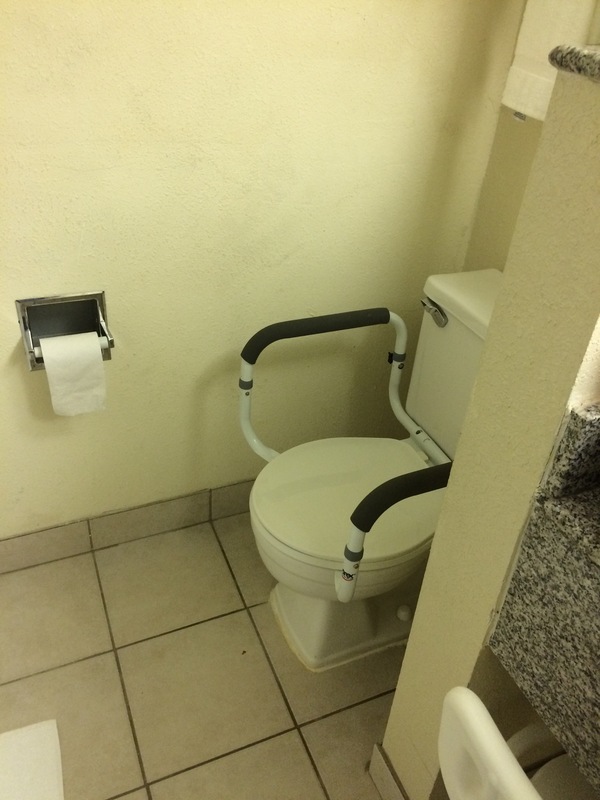 Need a good ADA room? I would have to recommend skipping this hotel. I just don’t think they are where they need to be yet. Hopefully they will take the steps to improve this over time and if we visit again, I will update this post if they do make changes. Since we stop near Bloomington whenever I bring mom back and forth between Michigan and Missouri, I am sure I will have another chance at some point. It might not be the fanciest place to stay in Bloomington, but when you’re saving your pennies and you appreciate the Choice Hotel line, this is one to consider! Have you stayed here before? Do you travel with your pets? Leave your comments below! Everyone views beauty differently. For some, sunsets, for others sunrises. It is easier to say someone or something is beautiful than to say YOU are beautiful, or we want to clarify it. Beautiful soul, beautiful personality, etc. How can you ask others to find you beautiful if you don’t find yourself beautiful. Look in a mirror and tell the face looking back at you how beautiful you think he / she is! 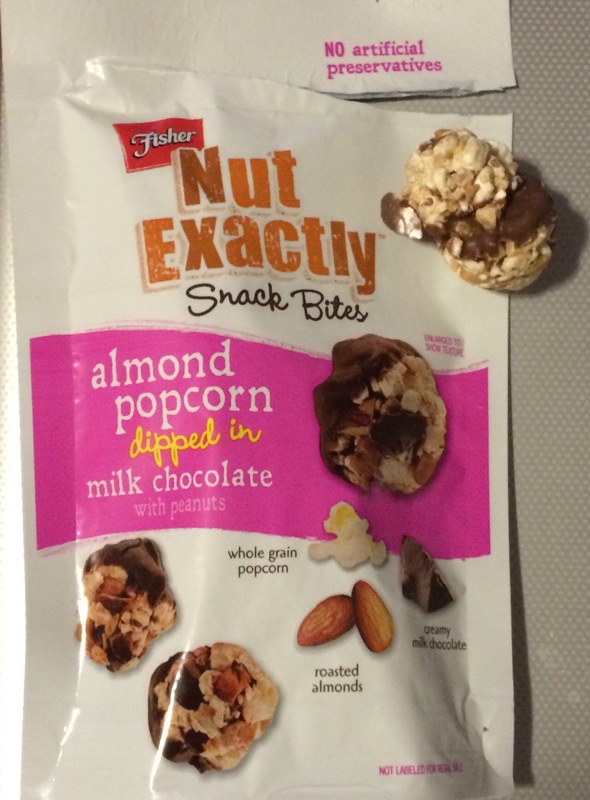 I recently had an opportunity to select Fisher Nut Exactly Snack Bites Almond Popcorn dipped in Milk Chocolate as an option with PinchMe. PinchMe is a site that offers you free samples from time to time. All they ask from you is for you to supply feedback on the products after you try them. The one bad thing is you have to be quick when they announce the free sample Tuesday or you miss out on things you might really like to try. I was pleased because they are pretty cut and dry ingredients. 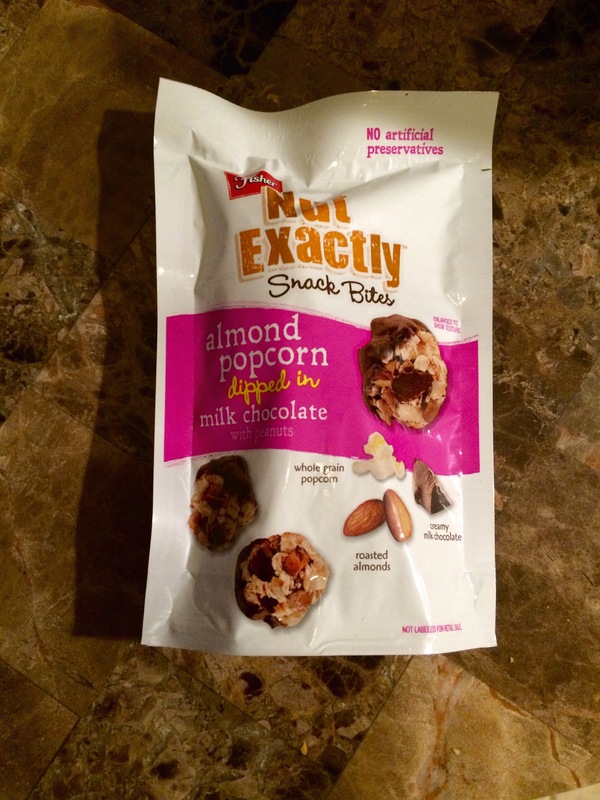 With only 15 calories per snack bite, they would be a nice way to get your sweet tooth and salty desires filled with the same snack. I opened the bag and was questioning the “snack bite” size. When I think of a snack bite size, I usually think of something I can pop into my mouth and eat. These were a little big for that. I ended up biting them in half. With that in mind, you had to pay attention to bite it in the right manner or you wouldn’t get any chocolate. For a snack bite, it requires too much attention! I bit it, being careful to get both the popcorn and the chocolate in my mouth. Sadly, I was VERY DISAPPOINTED! It was very bland. I didn’t taste any flavor. I took the second piece and bit into just the chocolate, focusing on the taste. It tasted like cheap chocolate you buy for someone you don’t like. I would almost prefer smaller sizes with better tasting chocolate to get the 15 calories per bite. Biting into the popcorn side, I tasted a slight saltiness of the popcorn but it was like biting into a packing popcorn piece, not an actual piece of popcorn. 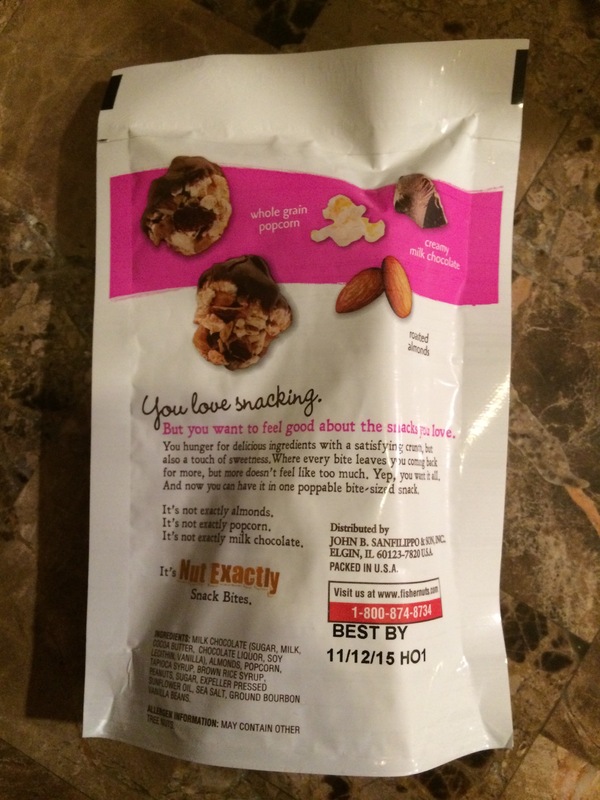 I made a point of the third piece, trying to taste the almond, and I couldn’t. I can see almond bits in it, but I just couldn’t distinguish any taste exactly. The best comparison I had for it, other than the bad milk chocolate, was it reminded me of the first time I bit into a rice cake. I had thought we had come a lot further in the design of lower calorie snack foods. If you have tried this product, please share your thoughts in the comments. I recently had an opportunity to select Kraft Seasoned Grated Parmesan Cheese in their Classic Italian flavor as an option with PinchMe. PinchMe is a site that offers you free samples from time to time. All they ask from you is for you to supply feedback on the products after you try them. The only bad thing is you have to be quick or you miss out on things you would really like. In my most recent box, I received a 3 oz sample of Kraft Seasoned Grated Parmesan Cheese in the Classic Italian flavor. Growing up, Kraft Parmesan Cheese was our go to Parmesan cheese. I didn’t even realize, until I was an adult, you could purchase a block of Parmesan cheese and grate it yourself, which is my normal method now. I was excited to receive this, as it had additional flavoring to it, so I thought it would have more uses than just sprinkling over a dish. I never realized just how handy it would be. My mom and I had gone to a local Italian restaurant I had never been to before. The restaurant we were originally headed to had a line around the corner waiting to get it, so I decided to check this restaurant out. Mom and I both like Italian food so I figured it would be a good option. While the service was good and the soup (mom) and salad (me) was very good, the food itself was severely lacking. I didn’t mention my thoughts to my mom until after we left. The portion sizes were large enough for us to have some left over. My mom felt the same way. She felt Alfredo sauce from a jar had more flavor than her meal did. I didn’t want the food to go to waste, but neither of us was looking forward to eating it again. I decided to try to doctor it a little. I took her Chicken Fettuccine Alfredo out of the refrigerator, added a little bit of butter and milk, some oregano, some garlic, and then used the Kraft Seasoned Grated Parmesan Cheese as well. I figured it was as good of an opportunity to try this as any. After it was heated up, I sprinkled it with more of the Kraft Cheese. I was pleasantly surprised by how improved it was! My mom, who was not looking forward to eating it because she didn’t think I could improve it, actually liked it. I sprinkled quite a bit of it over my Chicken Parmesan, which also had no flavor in the chicken or the breading. Because the flavor couldn’t get into the chicken, it improved it slightly, but did more for the Alfredo. In my opinion, if this product can improve the taste of bland restaurant leftovers, it has my endorsement! It’s a quick way to season your food before cooking as well as sprinkling over the dish prior to serving it and eating it. One of the joys of writing about a Facebook game such as Candy Crush Saga, like I did yesterday led to my news feed on Facebook having game ads. This is different than the game requests we get from friends I wrote about before. 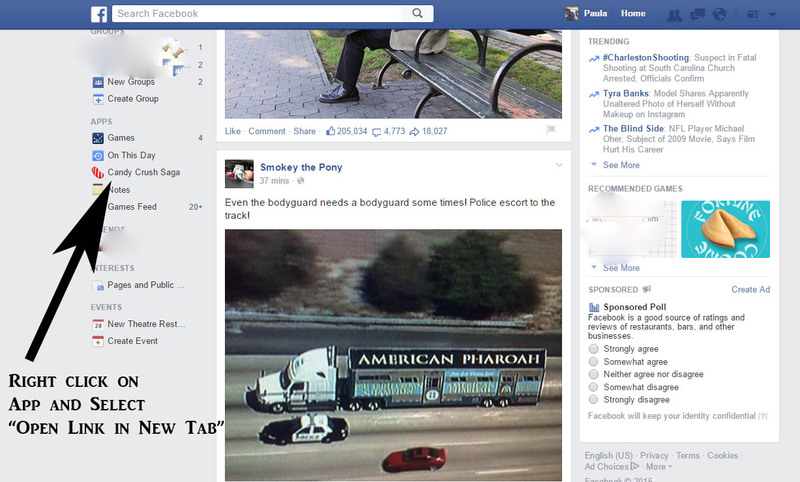 These ads show us what games our friends are playing. I don’t fault someone for playing games on Facebook, I just don’t want my news feed filled with advertisements about all the games I can play. 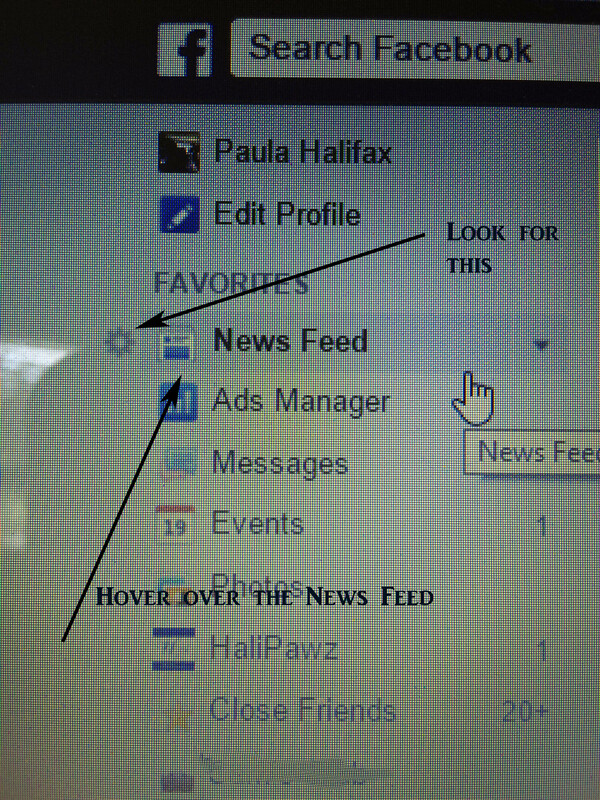 This post will show you how to minimize them and how to control some of the options of your Facebook News Feed so you see what you really care about and not everything else. As with most things on Facebook, if you want to make adjustments and changes, the easiest way is to do it from a desktop or laptop. 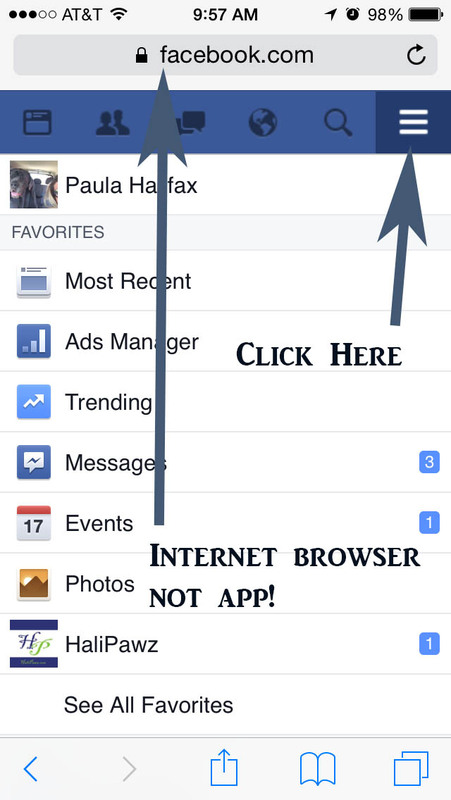 If you don’t have access to those, open Facebook up in your web browser on your smart phone or tablet, not in the app, click on your options (my pictures show on IOS so it may be different on another phone or tablet but it should be in a similar location) scroll all the way to the bottom, and click on Desktop Version. As you can see, it is pretty small, so it is a lot easier to do on a desktop or laptop computer but if you don’t have it, then make the best of it! So, now we are ready to begin. 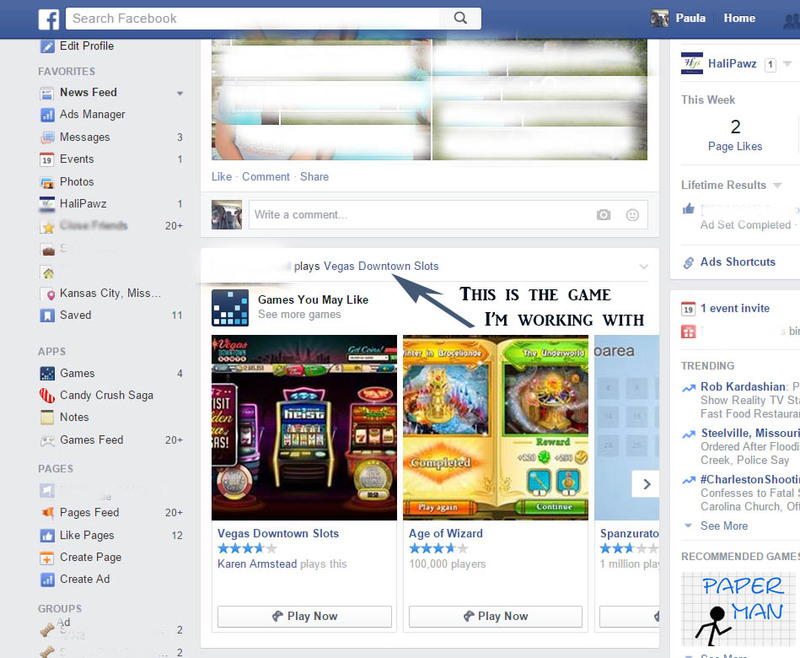 Step 1 – Determine you do not want to see a particular game’s advertisement on your feed anymore. I have chosen Vegas Downtown Slots. I will never play it and I don’t want to continue seeing it. 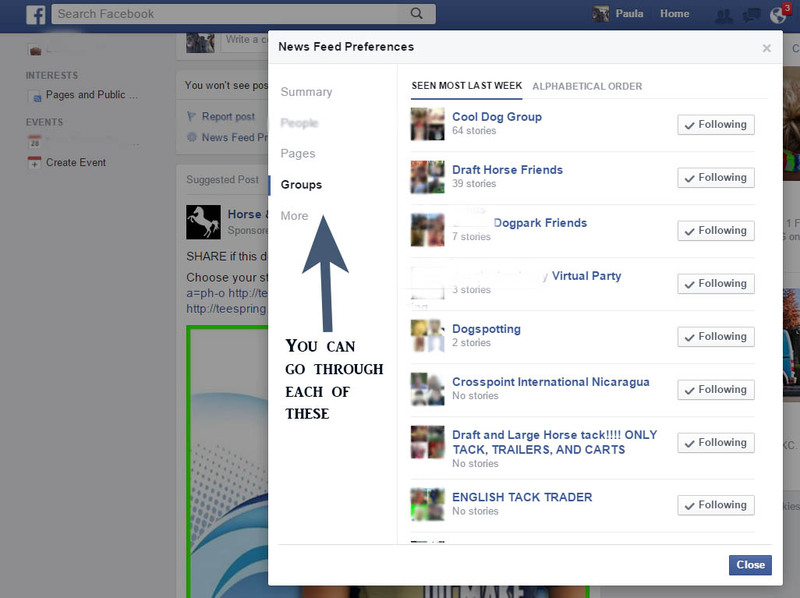 Step 4 – Go through each option, look to see which groups, people, etc you want to “follow”. 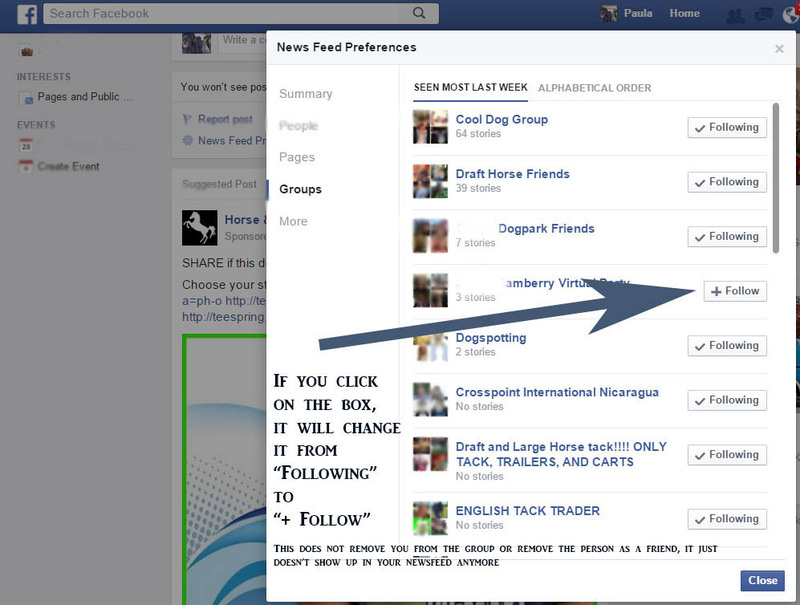 If you don’t want them showing up on your news feed but you don’t want to remove the group or the person, just click the “following” box. All the ones with a check mark next to them are ones you have showing up in your news feed. If they have a ” + Follow” box then they are not showing up. 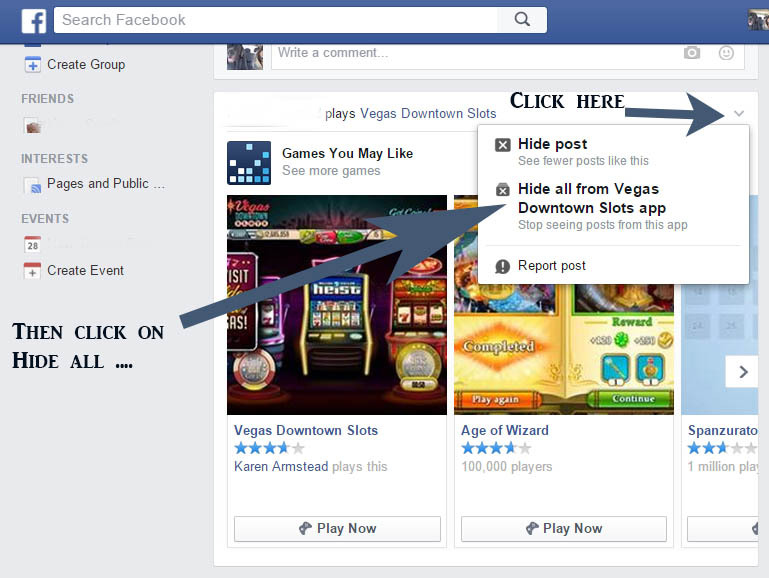 Step 5 – Click on any you do not want to show up in your news feed. Once you have gone through each category, you can just close it and you are done! 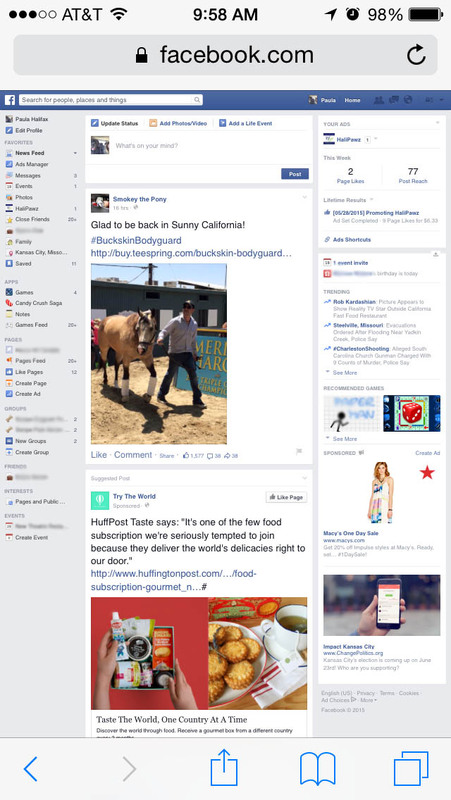 Your news feed will be more of what you WANT to see and less of what you don’t! 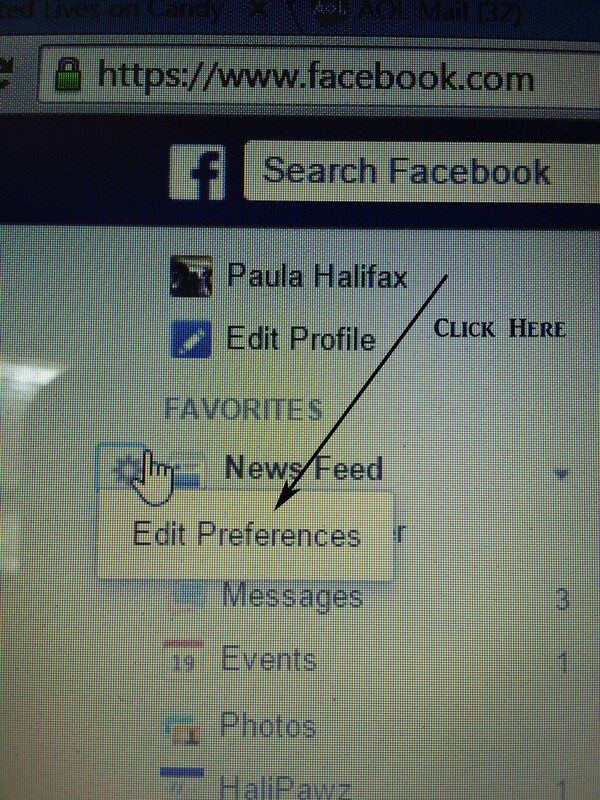 Make sure the ones you do not want showing up in your news feed have and + before the word follow. Forgive the graininess of these pics, I couldn’t hover and do a screen shot at the same time so I had to take with my iPhone. 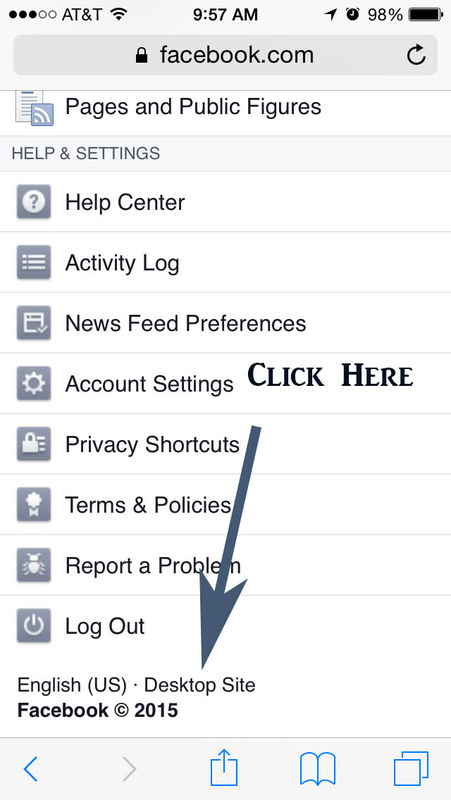 I hope this helps you have a better experience with your Facebook News Feed! 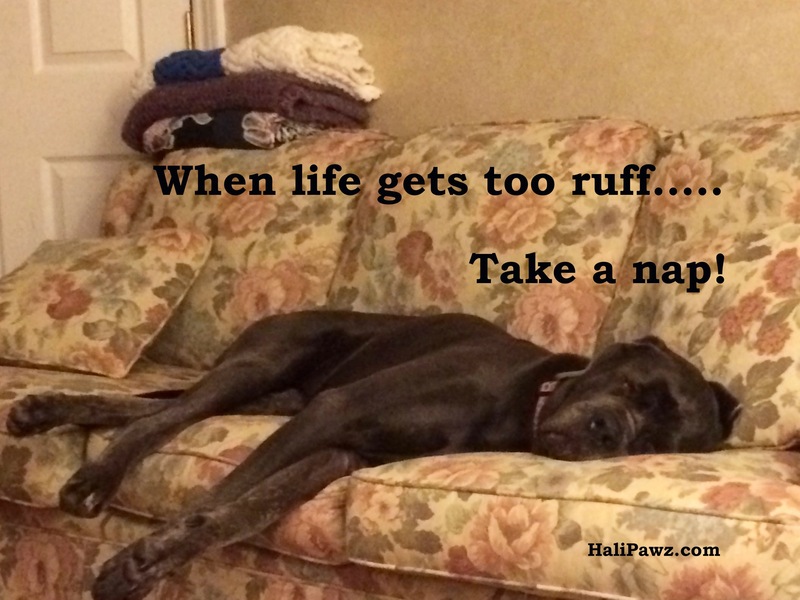 Let’s face it, sometimes we need to take a break from working hard and what do most of us do? Pick up our cell phone or tablet and start looking at social media, like Facebook and Twitter, or we play games. 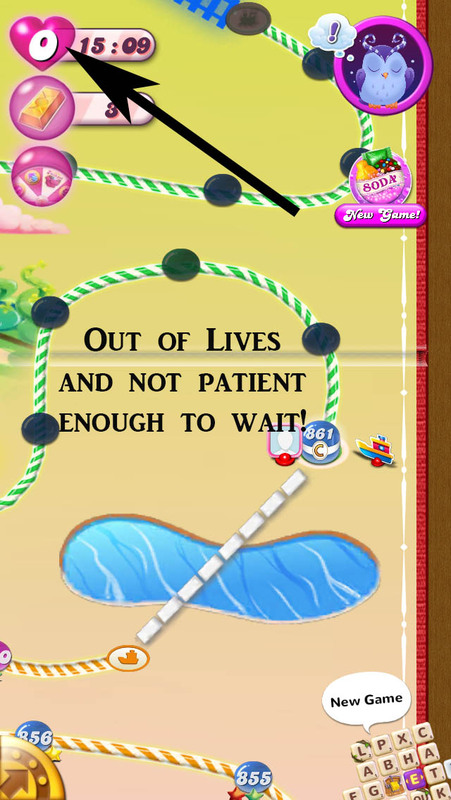 I have to admit, my go to game is Candy Crush Saga. I refuse to get hooked on any other game because I think I can have an addictive personality and if I start with another game, I’ll just be playing two games instead of one. 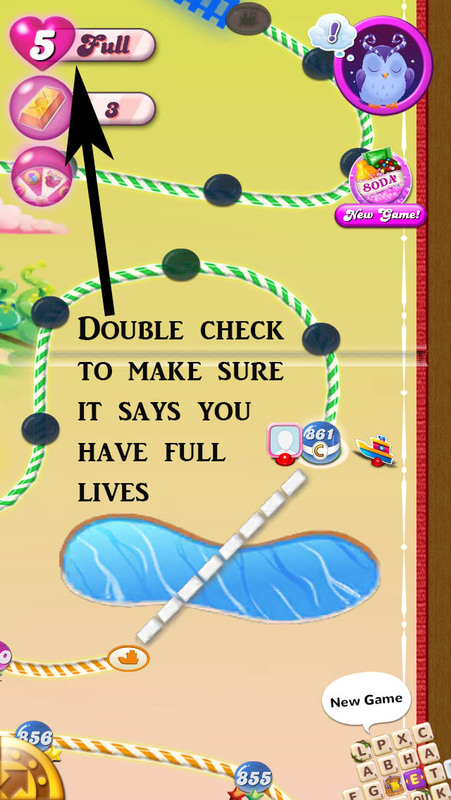 I am currently on level 867. I will tell you, if you aren’t there yet, there are some really difficult levels and some pretty easy ones. The difficult ones are great because they make you think, but at the same time, I hate it when I’m just starting to get into a rhythm, figure out the pattern I want to use to win it, and then I’m out of lives! 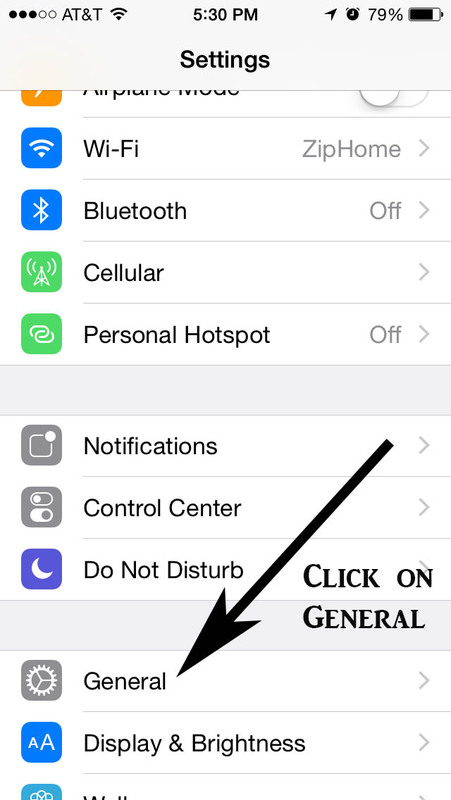 If you play CCS on an iPhone, iPad, etc using the IOS (Apple) system, here are the steps to keep playing, even if your friends haven’t given you any extra lives. I will tell you, if you are playing CCS, please be nice and click on the “Give Extra Moves” option when it pops up, your friends will thank you for it when they are stuck on a level! 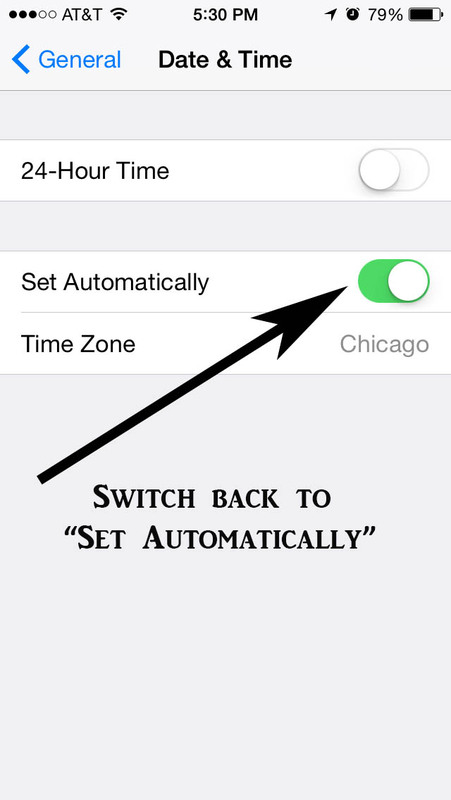 Step 5 – Move the date forward one day (You can do a couple of hours, but I have found just moving it down one day is easier and faster) When you tap the date you will get a rolling calendar. 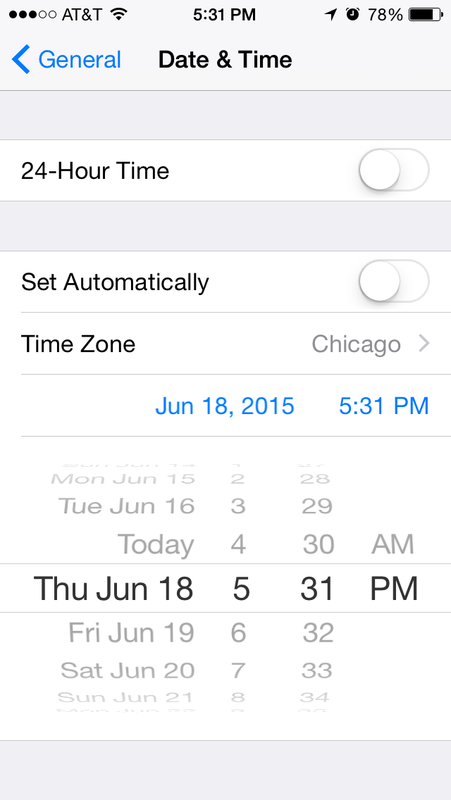 See the June 17, 2015 in the picture above? 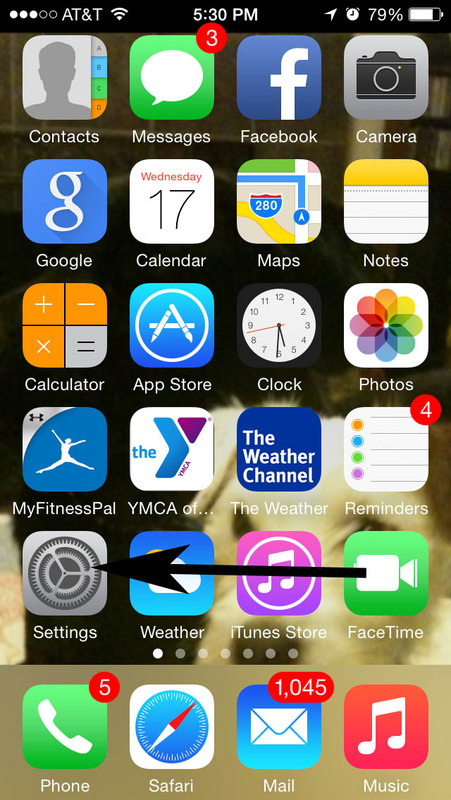 When I click on it, I get a rolling calendar like the one you see in this picture. When you see it, just take your finger and move it from where it is to the next day. It is the fastest way to do it. 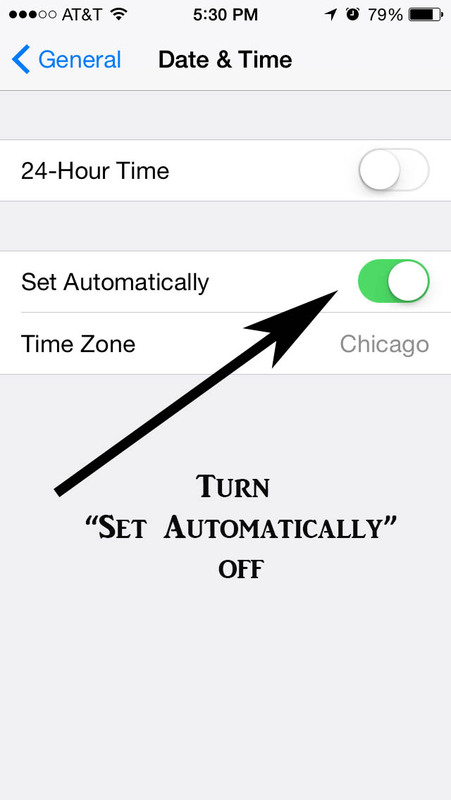 Step 8 – Go back and ENJOY YOUR GAME! 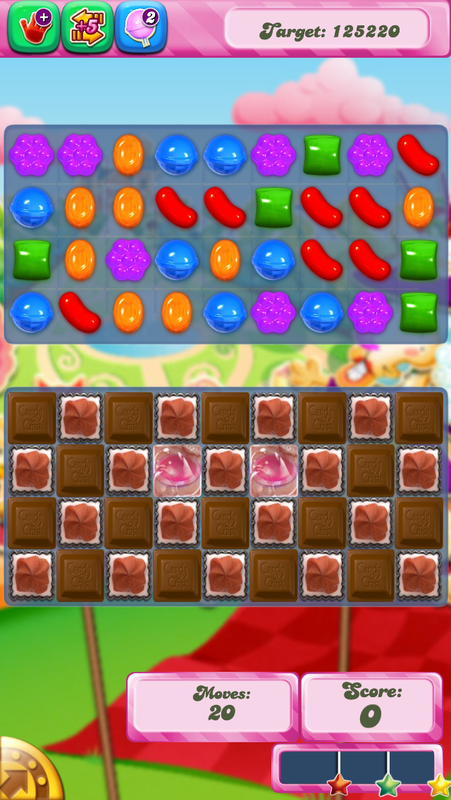 Added Bonus…..if you want to keep your game going on the desktop or laptop version of Candy Crush Saga, just right click on the Candy Crush Saga app in Facebook and select open link in new tab. 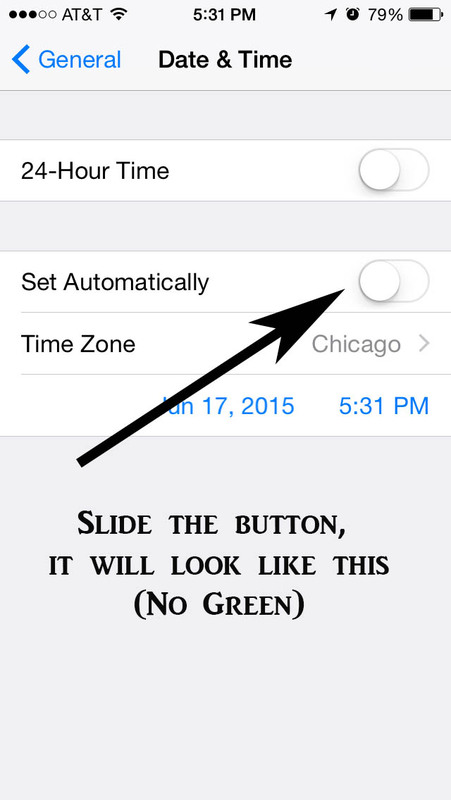 Open up five or six of them, give them all time to load, and you have 25 – 30 + lives, depending on how many you open! Hope this helps you enjoy your Candy Crush Saga game even more! 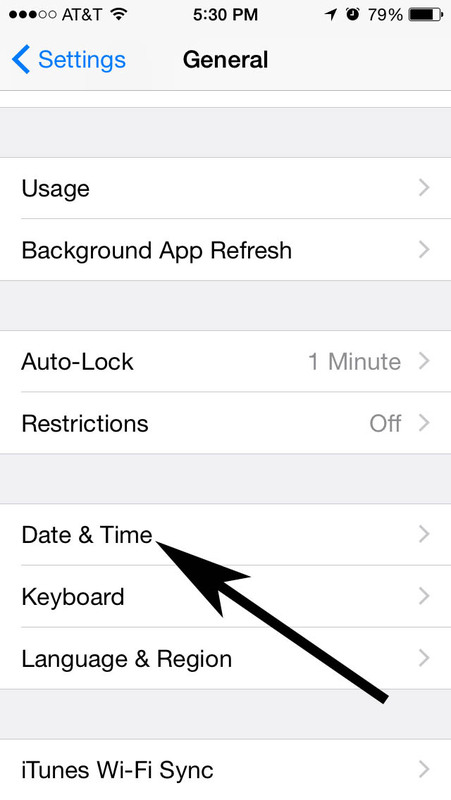 Remember to pay attention to the time when extending your play, an hour can disappear quickly!